Review: "Using App Data Room to Differentiate Us from the Competition"
Prior to deploying App Data Room, our company was distributing hard copies of our marketing collateral and forms. Using this approach, our collateral did not include video options. App Data Room was deployed across our entire field sales team. 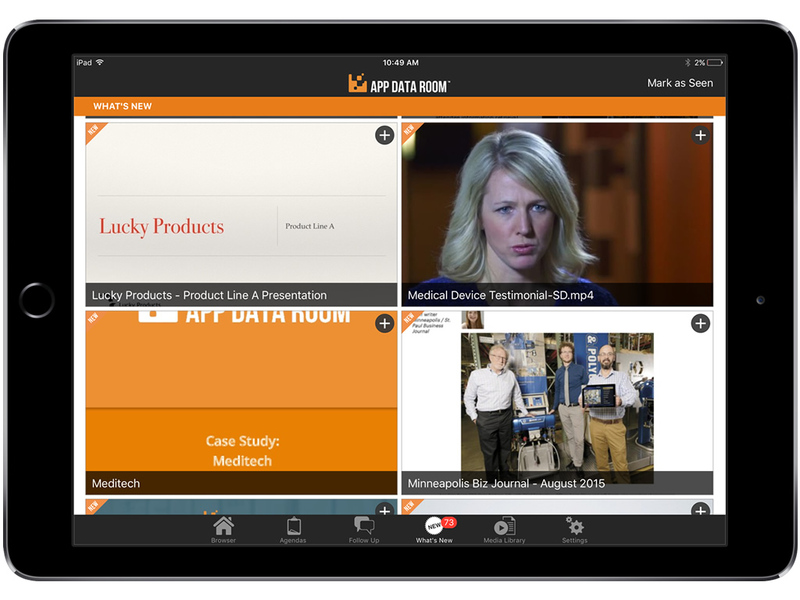 Today approximately 50 sales reps use App Data Room to present video and written marketing collateral to potential customers. App Data Room also allows our Marketing Department to modify and add marketing collateral to the library without relying on a third-party vendor. In our case, we have sales reps across the country. 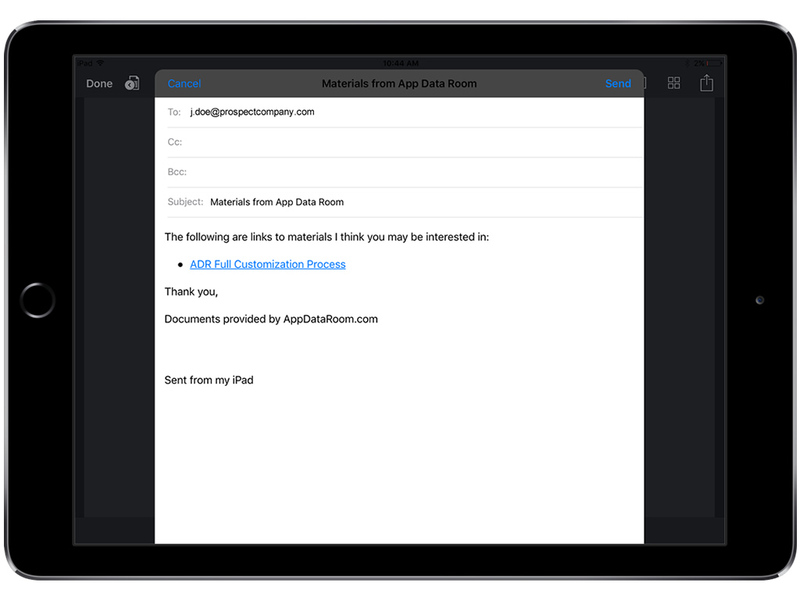 App Data Room allows us to make new collateral available on-demand. The implementation of App Data Room also has resulted in significant reduction in our spend for printing hard copies. The app is intuitive for our reps and was not difficult for them to grasp. 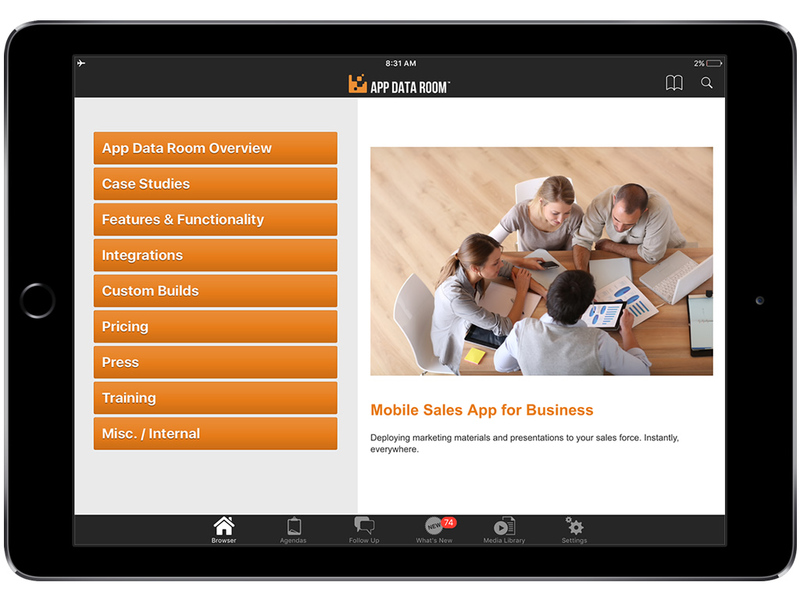 App Data Room Review: "A Sales Tool Solution that Works"
We use App Data Room for our sales team. There is a monthly license fee per user and we have a little over 100 users company-wide. It is the sales tool loaded on our sales teams tablets and laptops. The App is a very useful tool and apart from some of the linked videos all of the content is available offline. We really like the fact that we can show interactive 3D spins of our products. The support team at ADR is excellent, they are very responsive and are constantly upgrading the app with new and improved features. We are very happy with this sales and marketing tool solution. Content Mangement System - Our Marcom department is able to maintain and update the app in real-time and push updates directly to our team without going to an outside vendor. The CMS has a great UI/UX and is easy to use and maintain. What's New Feature - Our sales team can easily see every time we make additions or updates. 3D capabilities - the ability to use animation image sequences on the app really impresses our customers. Support - ADR provides great support. I wish the App UI was the same across all platforms. The app looks different on Windows than iOS. ADR is a great interactive tool for B2B businesses that sales deals one-on-one with the customer. I don't think it would be well suited for B2C businesses because of the need and cost for individual licenses per user. I would highly recommend this tool to B2B companies that practice traditional sales with a technological edge. App Data Room is a leading enterprise mobile sales enablement platform that assists global sales and marketing teams to organize, store, share, present, and track content. According to the vendor, the platform is designed to be highly intuitive and integrates with core enterprise software systems for an entirely seamless experience. Additionally, the vendor says enterprise marketing teams appreciate the insights generated from the platform and the ability to push the latest marketing content to their networks of sales reps, distributors and channel partners in an efficient manner. Today, App Data Room services tens of thousands of users globally. Has featureSales Asset Management - Effectively support users anywhere in the world, in any language. 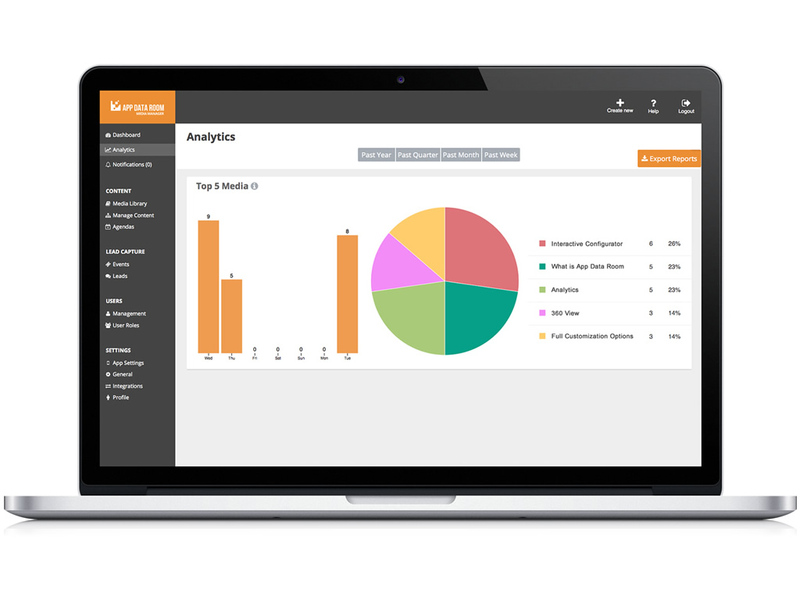 Has featureIn-Depth Analytics and Reporting - Know which materials and users drive results. 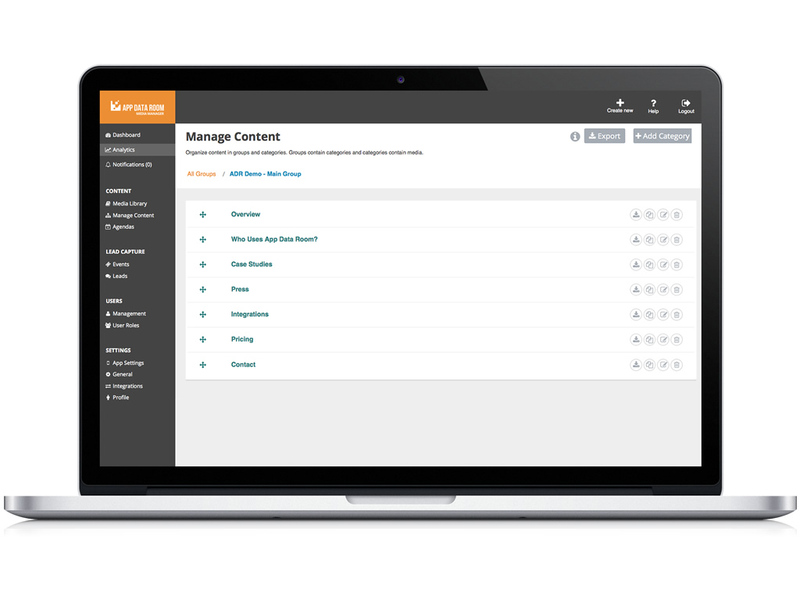 Has featureAlways Up-To-Date - Easily standardize the delivery of content company-wide and push updates instantly. Has featureInstant Follow-Up – Send follow-up emails instantly to prospects and customers. Has featureWorks Online or Offline - Access and view all content and features with or without an internet connection.